Their first meeting was worthy of a romance novel and it happened because Ken and Rusty Butler both loved books. The young professionals grew up on opposite sides of the Atlantic Ocean, but their shared passion for reading led to a fateful meeting in a library. Elsie Marie White Butler, nicknamed “Rusty” because of her beautiful auburn hair, was born in 1922. She spent her first six years on the White family homestead in Aurora, Oregon before moving to Portland. Her great-grandfather and his family had arrived in Oregon in 1851 after crossing the prairies in a covered wagon. She attended Rose City Park Elementary, graduated from Holy Child Academy, won a full scholarship to Marylhurst College, and then earned a second bachelor’s degree in Library Science from University of Washington. A lifelong Anglophile, in 1950 Rusty was hired as a children’s librarian in Leeds, Yorkshire, England. During a tour of the branches, she was introduced to one of her colleagues. The young man agreed to read poetry aloud to demonstrate the Yorkshire dialect to this American visitor. Rusty didn’t understand a word of it, but she watched his neck grow red and realized he was embarrassed because it was a romantic poem! She made friends with that librarian and at the end of the year, she and Ken Butler made plans to marry. Kenneth William Butler, a native of Leeds, was also born in 1922. He attended Cross Flatts Primary School, passed his “11-plus” exam and received a full scholarship to West Leeds Boys High School. There, he served as a prefect and, as a 6th former, occasionally snuck into the pub for a pint. Ken passed his librarian credentials exam, but put professional ambition on hold to serve during World War II as a non-combatant in the Royal Army Pay Corps. By 1950, Ken had returned to library work, survived his first meeting with Rusty, and professed his love. 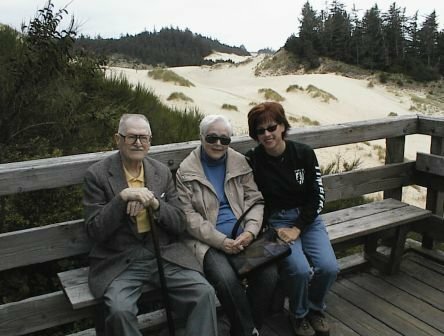 In 1951, he relocated to Oregon with his bride to be. Ken and Rusty were married at Saint Michael and All Angels Episcopal Church on September 5, 1952. Rusty resumed library work in Portland while Ken attended University of Portland, earning bachelor’s and master’s degrees in literature. In 1953, Ken joined the staff at Portland State University, eventually becoming a full professor and Assistant Library Director. He retired from Portland State in 1987 after 34 years. Rusty was a stay home mom with the couple’s three daughters, the twins, Margaret and Gillian and the youngest, Catherine. In 1966, she returned to children’s library work at Multnomah County’s Central Library, retiring in 1987. Ken and Rusty actively supported libraries throughout their retirement and gifted lasting legacies to their respective institutions: an endowment for purchase of children’s books at Central Library and the Butler Award at Portland State University to honor an outstanding member of the library faculty.